Making your own frosting is very easy and there are some good, inexpensive ways to add natural colors also. So, moms who are trying to avoid food coloring find themselves becoming cupcake bakers by necessity. Kids these days are always having parties - cupcakes at school, at sports and of course at birthday parties. 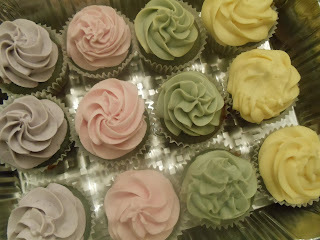 And it is rare to find a party with all naturally colored cupcakes, so it's always a good idea to bring your own. At school, many moms leave some homemade cupcakes in the freezer in a ziploc container. They thaw out in about 20-30 minutes, no problem. These are so easy you don't even need to pull out the electric mixer, a simple bowl and spoon will work just fine! As my 5 year old would say, "Easy Peasy, Lemon Squeezy". Preheat oven to 350 degrees. Grease cupcake pan or place liners in it. With a fork or whisk, mix together the dry ingredients. Then, while mixing, add in the wet ingredients. mix with a spoon just until combined. Fill each cupcake about 3/4 full. *Tip: An ice cream scooper with a mechanism to release the scoop works like magic here and fills each cup just right. Bake for about 20-25 minutes or until a toothpick inserted in the middle comes out clean. Here is a recipe for homemade buttercream and some natural ways to color it. Borscht is a traditional Russian Beet Soup that is delicious hot or cold. As an American, cold soup is a strange idea to me, but it is so refreshing on a hot summer day! This soup is quite affordable and delicious! There are many variations on how to make borscht. This is the way my mother-in-law makes it. Some people add meat, but I love that this is just veggies - nice and light! Wash 1 large beet, cut it in half and immerse it in a pot of water. Heat it to boiling and boil until a fork can easily be inserted into the beet. Remove beet from water (reserve water in pot for later use) and let it cool until it is cool enough to handle. Meanwhile, peel 1-3 potatoes (depending on your preference) and cut them into small, bite sized pieces. Add them to the hot water and boil them until they are softened. Once cooled, remove skin from the beet and discard (skin will slip right off the beet after boiling). Shred beet in food processor or with handheld grater. Add shredded beets back into the boiling water along with the additional veggies prepared in step 2. Saute onions, garlic and carrots on the stovetop in olive oil until softened and flavors are released. Shred and chop about a half a head of cabbage. I shred it in my food processor and then roughly chop it by hand because you want to make sure that there aren't any pieces of cabbage that are larger than bite-sized. After adding the additional veggies to the pot, you will need to add additional water to make sure everything is nicely covered with water. Add at least 1 tsp of sea salt and a generous pinch of your favorite seasoning blend. (my in-laws use Vegeta, but I don't know how natural that is, so I use Morton's Nature's Seasoning Salt). When you are ready to serve the soup (hot or cold), prepare the following garnishes to set out on the table. Guests may add any of them to their own bowl of soup and create their own, personalized taste sensation! In my opinion, adding a dollop of sour cream and dill are the two absolute essentials! Since a couple of members of my family must eat gluten free, I really do not ever bake with wheat flour anymore. Luckily I have a great gluten free baking mix recipe that I keep stocked in the pantry and with it I can make any of my old favorite recipes gluten free. We tend to host large dinners at least once or twice a month at our home, often 10-20 college students. For these dinners and when I need to bring a dessert to a potluck, this sheet cake is my standby. The most expensive ingredients are the eggs and butter. If you always get them on sale, it can be a pretty inexpensive dessert that feeds a lot of people. (I buy my coconut flour at Dekalb Farmer's Market in Decatur for only $1.59/lb. And it's so rich and delicious, everyone loves it! I make mine in a sheet cake pan - 18x13 inches. This makes it thin, but that is a good thing when I need it to feed a lot of people. You can bake it in a 9x13 pan and it will just be a little thicker. Preheat oven to 375 degrees. Grease 9x13 or 18x13 pan. Mix all ingredients well. Beat for about 2 minutes in Kitchenaid or with hand beaters until batter becomes a lighter color and shiny. Pour into prepared pan and bake for about 20-25 minutes. Larger pan will need less cooking time. To see if cake is ready, touch it in the middle and see if it springs back. While cake is cooking, prepare topping. Pour topping on cake as soon as it comes out of the oven, while still hot. Serve warm, or wait until cooled. Once cooled topping will adhere to top of cake and will not be runny. I have served this cake alone and with vanilla ice cream. Both are great! For career day at my kids' elementary school I went and talked to the third graders about the all-natural bakery I started with a friend. I always like to teach them something about why I believe all natural ingredients are important. Last year I took a bunch of fruits and veggies and we discussed what we can use to color frosting naturally, such as beets, red cabbage, carrot juice and turmeric. This year, I decided to teach them about how we can incorporate very healthy ingredients into special treats to make them more nutrient rich. I started by feeding them - always a good way to start with a bunch of 8 and 9 year olds! 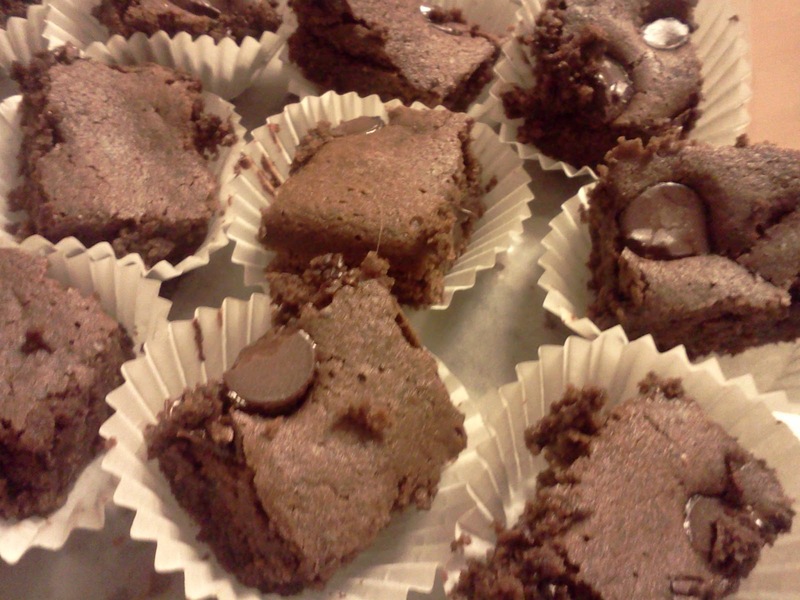 I passed out theses brownie bites and asked them to guess what ingredients we used to bake them. They did a good job of guessing all the traditional brownie ingredients. By this point, they had eaten all the brownie bites and were oohing and aahing about how yummy they were. I then whipped out a hidden can of black beans and revealed my secret, "the main ingredient in those brownies was BLACK BEANS!" This was met with a big "ewwww!" from all the third graders. They couldn't believe it because they had really enjoyed the brownies. I asked them how many would not have tried the brownies at all if I had told them what they were made of and over half the room raised their hands. The moral of the story is - these are GOOD! And, the other moral is - DO NOT tell your family that they are anything other than brownies! NEVER mention the word black bean and they will likely never know. In the meantime, they will be begging for more of this protien and fiber packed treat. gluten, dairy and soy free! Blend/puree until mixture is smooth. Pour into a greased 8x8 baking dish. Sprinkle 1/4 to 1/2 cup chocolate chips on top. Bake at 350 for about 30 minutes until the top is fairly set and dry. Let it cool, cut into squares and serve. When I first started baking gluten free for my toddler, I used Bob's Red Mill all purpose baking mix. It was easy because it works well in most recipes. But, it is heavy on the garbanzo bean flour and you really can taste it....or sort of smell it...in the finished product. I got tired of it. There are a lot of good all-purpose gluten free flour mixes out there, this is just one that has worked for me. It replaces wheat flour in most recipes very well (as long as you add the right amount of guar or xanthan gum) and it makes a pretty nice, light crumb. I use it to make these delicious dinner rolls from Simply gluten-free's blog. They are one of the lightest, fluffiest gluten free yeast rolls I have made. Combine all the ingredients in a large bowl and mix well with a wire whisk until well combined. Then, store in an airtight container. *xanthan gum is derived from corn in some way, shape or form, so guar gum is a corn-free alternative. Both of these gums can be found in the baking section of Whole Foods or the organic/gluten free section of your local grocer. **Tapioca starch is the same as tapioca flour and it can be found for a very good price at a local asian market. White rice flour is also very cheap at an asian market. 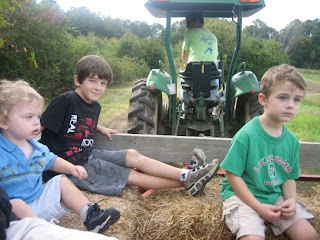 Sustainable Farming and the Documentary "Fresh"
I will never forget lying on the ultrasound table with my third child and finding out I would be the mother of three boys! I got tears in my eyes...partially because I had hoped for a daughter, but also because I was anticipating lots of work and a house full of energy and noise in the years to come! I often remind my husband of his first words after we 'saw' that it was a boy. He said, "it'll be okay, honey, we'll just move to a farm where they can run!" Well, we haven't moved to a farm yet...but we do have a bigger backyard now and we love to visit local farms. I just watched the documentary "Fresh" (www.freshthemovie.com) which is free to watch here, on Dr. Mercola's website until March 3, 2012. The movie's website also has a search function to find a screening near you. It is a great documentary that features farmers, thinkers and business people from across America. I learned that the way industrial agriculture is farming and raising livestock is not only hurting our health by loading our food with chemical pesticides and feeding the animals we consume with grain which is laced with antibiotics. Also, the industrial system is depleting the land of it's natural resources and naturally occuring nutrients and minerals. One thing that was very encouraging in the movie was to hear from Andrew Kimbrell, the Executive Director for Food Safety. He said that they now have the science to prove "that medium sized organic farming is far more productive than any sized industrial style agriculture". It is simply not true that organic farming is too expensive to feed the world, says Kimbrell. He says the studies and data prove that all the inputs on the modern industrial farm (machinery, pesticides, chemical fertilizers) make it "unsustainable". I loved watching the interviews of the sustainable farmers and learning how they follow traditional methods of rotating the grazing and having the chickens follow the grazing cattle and how it all works together to benefit the entire farm and produce more healthy animals and crops. Watching this film made me think a lot about my grandparents. My mom grew up on a farm in South Alabama and her mom raised crops, chickens and pigs. 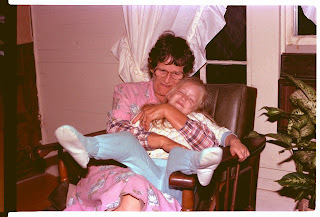 I remember sitting with her snapping beans and preparing them for canning or freezing. We had a deep freezer growing up full of my Memaw's home-grown vegetables and pecans that she shelled herself. She had a big pecan tree right in her yard. I remember once when I was probably about 9 or 10, she sent me to her garden to get green onions and I had no idea what to look for! I have great memories from my Memaw's house. My dad has been very successful at growing tomatoes, okra and peppers in his yard here in Georgia. He even planted me some tomatoes and peppers last summer. It was so much fun for me and the boys to watch them grow. After watching "Fresh" I am more determined than ever to take my kids to the Farmer's Market on Saturdays to pick out our fresh, local produce and to visit farms whenever we have a chance. There is something great about learning where your food comes from and all the work that goes into it. It also really helps us to appreciate the intricacy of what God created in the natural world! 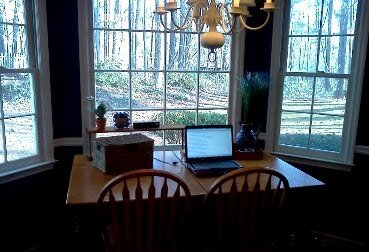 Hi, I'm Sarah and I've always wanted a kitchen desk. You know, one of those cute little desks where everything is well-organized and adorable? Ha! Maybe one day... I'm a mom of three boys...our house is full of adventure! I am also an advocate for healthy eating and a member of the Feingold Association (www.feingold.org). I hope many more will join the movement to eat real food. Our bodies and our children will thank us! All the recipes I post will be 'Feingold Friendly'. Eating natural food with no artificials helps our family deal with ADHD, mood swings and eczema. 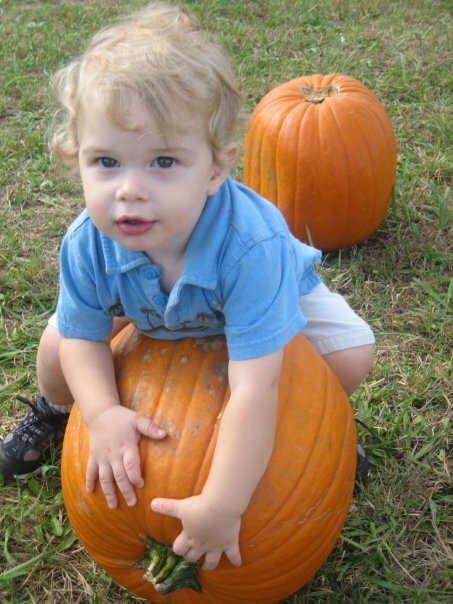 You can read my post about real food for real kids if you want to learn more about the food-behavior-health connection!